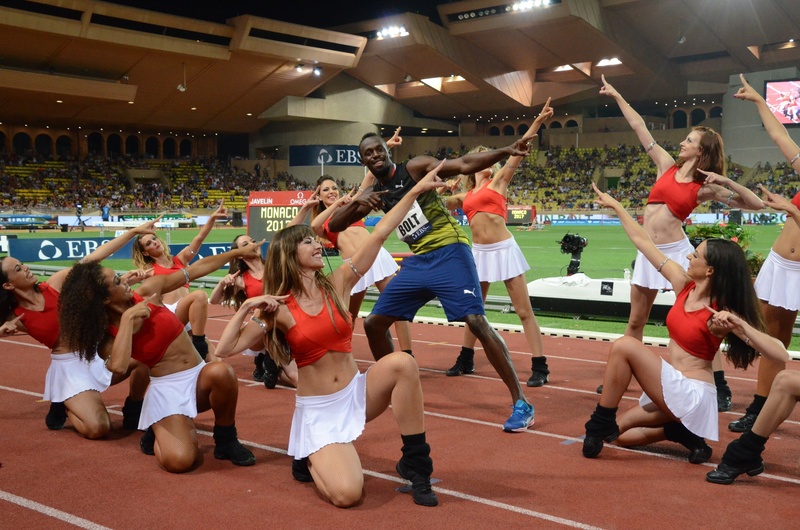 At the IAAF Diamond League meeting in Monaco on Friday night (21), Usain Bolt demonstrated once again, as he approaches his career’s finish line, that he is still a winner. Despite making a sluggish start on the Stade Louis II track, the Bolt effect a sporting world has come to know and love duly took place from 30 metres onwards, and with 20 metres remaining the 30-year-old was already closing down and cruising before he crossed the line in 9.95, 0.03 ahead of his closest challenger, Isiah Young of the United States. He had said ahead of his appearance at the Herculis meeting that it “would be good to dip under 10 seconds” – and now he has his wish as he prepares himself for next month’s final challenge of defending his world 100m title. But statistics are never quite the story with Bolt. With a season’s best of just 10.03, for instance, he was second slowest in the field. Enough said. Third place on a night which marked the 30th anniversary of the Monaco meeting went to South Africa’s Akani Simbine in 10.02, with Britain’s Chijindu Ujah fourth on the same timing. “It was good, I’m going in the right direction, there’s still a lot of work to do,” Bolt said after running a time that now moves him up to joint seventh on a 2017 world list headed by Christian Coleman of the United States with 9.82. “I am always here for the fans, and of course I will miss the vibe around the track. There are mixed emotions always – happy for my career, sad that it is ending. “Running sub-10 is always good. It was an exciting race, there was lots of energy. Bolt had looked characteristically relaxed as he wound up the shoulders, did the grin, did the peek-a-boo for the cameras as the field was introduced to the crowd. It didn’t stop some of the others trying for the same kind of effect – but the effect was not the same. After the last event was over, Bolt stood alone on the podium, watching along with everyone else a brief history of his time as it appeared on the big screen. When the last of the images from the Rio 2016 Olympic Games had spun past, the picture turned live – and the showman obliged, as ever, with a leisurely trademark ‘To The World’ pose. He was then, as promised, presented with a giant golden figure of Hercules – fitting indeed in this part of the world, and at the Herculis meeting – by Prince Albert II. Bolt’s next challenge: getting it home. For another 30-year-old world record-holder, however, the evening ended less happily. Stricken was probably the best word to describe Renaud Lavillenie’s expression. Certainly the politest word. Seconds earlier, the ‘home’ crowd had roared the 2012 Olympic champion down the runway as he sought to clear 5.82m with his third and final attempt, and thereby to maintain a challenge to the Pole who had established himself as the event’s leader, Piotr Lisek. Up and over went the white-shirted figure. The bar remained, trembled. Fell. In that moment, hopes of a morale-boosting victory ahead of his imminent attempt to earn the only title that has so far eluded him disappeared. There had been a big roar of relief as Lavillenie had cleared his opening height of 5.72m at the second attempt. As it turned out, however, that was to be his only clearance of the evening and he had to settle for fifth place. Lisek was the only man to clear 5.82m, with six men behind him on 5.72m. Countback meant second place for Jan Kudlicka of the Czech Republic, with Lavillenie’s younger compatriots Kevin Menaldo and Axel Chapelle third and fourth. Canada’s world champion Shawn Barber finished one place below Lavillenie, while Brazil’s Olympic champion Thiago Braz, who failed to register a height in Lausanne last week, was ninth with 5.60m – which equalled his season’s best. While there was disappointment for Lavillenie, there was relief for another 30-something Olympic field event champion, Caterine Ibarguen. The 33-year-old Colombian, beaten by 21-year-old Yulimar Rojas at last month’s IAAF Diamond League meeting in Rome, held off her younger Venezuelan challenger tonight, just, in a hugely dramatic contest. Rojas, the world indoor champion, led from the start, extending her advantage with a second-round effort of 14.72m. Ibarguen got close in the fifth round – 14.67m – but not close enough. Endgame. And the 33-year-old champion produced an effort of 14.86m to take the lead. Now the question went to the 21-year-old. Her response was terrific – and three centimetres short. What a final it is going to be in London. There was a struggle of similar intensity in the men’s javelin, where the two Germans who are leading the charge towards Jan Zelezny’s world record territory – Olympic champion Thomas Rohler and Johannes Vetter – were seeking what could be a hugely significant win. Rohler, whose huge season-opener of 93.90m was eclipsed last week by the 94.44m which now has Vetter second on the world all-time list, had a determined glint in his eye coming into this contest and that translated with a “get a load of that then mate” opener of 87.06m which gave him the early lead, immediately followed by an 89.17m which effectively concluded the victory. Vetter had a thin time of it before getting significantly better in the fifth round with 85.14m, eventually taking third place behind the Czech Republic’s Jakub Vadlejch, who managed 85.43m. There was little doubt over the winner of the women’s high jump – the only question was: how high can Maria Lasitskene go? As the only woman to have cleared 2.00m this season, something she had done nine times, the world champion had arrived here as the clear favourite and five first-time clearances from 1.85m up to 2.00m settled the result. The question remained. Shifting her attention to 2.05m, a centimetre higher than Heike Henkel’s 1991 meeting record, Lasitskene cleared the mark at her second attempt before moving up to three unsuccessful attempts at 2.08m. It surely won’t be long. “I’m not thinking about world records, I’m just jumping my best from competition to competition,” said Lasitskene. Seems to be working out pretty well for her. The women’s 100m hurdles was as competitive as expected – and, as expected, won by Kendra Harrison. A year ago Harrison earned the bittersweet distinction of setting a world record of 12.20 on the eve of an Olympics for which she had failed to qualify. She has made no such mistake with this summer’s global championships, and having run 12.28 this season she has established a significant gap between herself and her rivals. Here the gap was only one hundredth of a second as she clocked 12.51 to finish ahead of compatriot Sharika Nelvis, who ran a season’s best, with Jamaica’s world champion Danielle Williams third in 12.58. Australia’s 2012 Olympic champion Sally Pearson, finding late form after winter illness and injury, started strongly but faded over the final three hurdles to finish fifth in 12.68. Still a contender, however.